Sesame which is known for properties of good health consists of a plethora of nutrients viz., proteins, carbohydrates, antioxidants, lignans, tocopherols and other micronutrients. Benefits of this enigmatic crop include properties of anticancer, antioxidative, antiimmunoregulation and antihypersensitivity. Covering wide agro ecological regions of the world, different varieties of sesame seeds are available. They are seen growing in different parts of the world, where India being one of the major producers. The oil from this seed can be extracted by simple processes of solvent extraction and expelling. Alternatively, as the technology has advanced, supercritical extraction can also be employed. Sesame which is considered as an extremely beneficial medicine has inherent power to cure many diseases. Sesame has a ray of health benefits in lowering cholesterol, controlling blood pressure, dermatological disease management and many more areas. This review gives an overall impact about sesame, properties and its role in various sections. Dating back to as early as 1600 BC, sesame seeds are the oldest condiment known to man. Sesame, Sesamum indicum L. belonging to the family Pedaliaceae, is widely cultivated in the tropical parts of Africa and Asia and about 36 species are said to be existent . Their wild species are located mainly in Africa and only a few in India . The original home of this crop is known to be Ethiopia . The major sesame producers are India, Myanmar, China and Sudan with 68% of the total world production . In the world, India ranks first in the production and area of sesame seeds and is grown in different seasons covering practically all agro-ecological zones [3,4]. Oil extracted from sesame is honoured as a rich food because of its high nutritive quality and stability . It has many uses and it is markedly different from other vegetable oils due to its high nutritional and therapeutic values. Potential health benefits of sesame include anti oxidative, anticancer, anti hypersensitive and anti immunoregulatory actions . The seeds are used for the production of oil, paste, salads and in various food formulations. From the chemical composition of sesame, it is known that the seeds contain 50-60% oil, 18-25% protein, 13.5% carbohydrate and 5% ash . The noteworthy stability to oxidation can be attributed to its endogenous anti-oxidant lignans along with tocopherols . Sesamin (0.4-1.1%), sesamolin (0.3-0.6%) and traces of sesamol contribute to the unique properties of sesame oil . In the eastern parts of the world, sesame has long been considered as a ‘health food’ that provides high energy and prevents ageing . The oil is rich in unsaturated fatty acids (85%) and has a mild taste 9. It is said to be plant breeder’s dream crop because of its great genetic diversity  (Table 1). Table 1: Diversity of sesame seeds . Sesame is a rich source of calcium (approx 1%) and phosphorous (approx 0.7%) . Sesame contains ample amounts of oleic (43%), linoleic (35%), palmitic (11%) and stearic acid (7%) which together comprise 96% of the total fatty acids . Sesame seeds are tiny, flat, oval with a nutty taste and delicate with almost invisible crunch. They vary in size from small to large and come in a host of different colours, depending upon the variety, including white, yellow, black, grey, brown and red. The seeds from northeast region of India are black; those from eastern region are brown to black and from south are predominantly red or reddish brown. Seeds from other regions are white . White and black seeded strains, on an average contain 55% and 47.8% oil respectively . White and black sesame seed coat fractions have considerable anti-oxidant property but the same is better in black sesame coats [3,7]. The oil extracted from coated seeds possesses high oxidative stability than that of dehulled seeds . Dehulling is necessary as the hull contains 2-3% oxalic acid, which chelates calcium and has a bitter flavor  (Table 2). Table 2: Varieties of seeds and their lignan profile . The production of sesame seeds is 170,000 tons per year in America; Mexico, Guatemala and Venezuela which impart 60% to the continent’s production . Samples of seeds from different states of India were analysed by K. Venkataramana Bhat et al. sing random amplified polymorphic DNA (RAPD) technique. Results showed the high level of genetic diversity, which indicated the nativity of the crop. Rajasthan and the north eastern states showed maximum diversity . Throughout the world the area under the cultivation of sesame is 6 million hectares, where 65% of crop is used for extraction of oil and 35% is used as food . Morphologically diverse seven genotypes of sesame are found, which represent different growing regions of India. These include CST 2002 and MT 34 from Uttar Pradesh, TKG 22 from Madhya Pradesh, AAUDT 9304-14-4 from Assam, B 67 and Rama from West Bengal . In India, two sections of sesamum are found – S. laciniatum and S. prostratum. Another section includes S. malabaricum which is locally called as ‘wild gingelly of Malabar’ . The industrialization of sesame oil is very important for food, cosmetic and pharmaceutical purposes. Final product quality and environmental aspects are the desired considerations for an adequate extraction process. Several processes for sesame oil production include mechanical milling followed by solvent extraction using organic liquids and solvent recuperation by distillation. Super critical extraction is an alternative process which uses pressurized fluids, minimising the use of liquid organic solvents . Sesame seed gives about 45-50% by weight of highly stable oil after extraction. Lignan content contributes to 32.23% in the extract by solvent extraction. Whereas in case of supercritical extraction, the lignan content is found to be 1.5-3.5%. The main lignans account for about 10% of unsaponifiable matter in sesame oil . By products obtained from sesame are rich sources of dietary fibres . Expelling is the simplest method of oil extraction by crushing, without the intervention of any chemicals. The desired quality of seeds for crushing is got by naturally drying, cleaning and grading the seeds. Cleaning and grading removes physical impurities. Clean seeds are later crushed in expellers and rotary machines by adding palm jaggery. Raw Sesame Oil obtained is stored in tanks. The sesame cake is packed and sold in the market as Animal Feed. Using filter press, raw sesame oil is filtered for fine particles. The Oil-Cake sludge from the filter press is added along with the sesame cake and crushed (Figure 1). Figure 1: Expelling: process flow chart. Distribution of the solute between two immiscible liquid phases which are in contact with each other, due to the density difference is the principle behind solvent extraction . In the process, unroasted seeds are first extracted by simple mechanical pressing followed by solvent extraction. Solvent extraction of sesame seeds with polar solvents and effective seed crushing generates more stable oil than nonpolar solvents and pressed seeds. Compared to n-Hexane, Heptaneisopropanol proves to yield more stable oil. Oxidative stability of the oil is influenced by the extraction method. Solvent extraction can yield approximately 52-55 % oil from the seeds . The disadvantages related with solvent extraction are complex extraction process, high cost and not suited for small scale processing. Management of organic solvents is one of the major problems [19-23]. The principle behind supercritical extraction is that, near the critical point of the solvent, its properties change rapidly with slight variations in the pressure involved . Supercritical extraction of sesame is usually carried out using carbon dioxide and propane as solvents. Extraction of oil using carbon dioxide includes 313 to 333 K temperature range, pressure variation of 19 to 25 MPa and constant flow rate of 3cm3/min and that using propane includes 303 to 333K range of temperature, pressures from 8 to 12 MPa and a constant flow rate of 0.8cm3/min . As the pressure and the supercritical CO2 flow rate is increased, the extraction yield can be improved and the time of the extraction process can also be reduced . The sesame seeds used in the process are required to be dried and milled with specified particle diameter . This process is more environmental friendly and the analytes can be extracted faster . The disadvantage in this process includes the toxicity of the solvent and difficulty in the understanding the phase behaviour between the solvent and oil  (Figure 2). 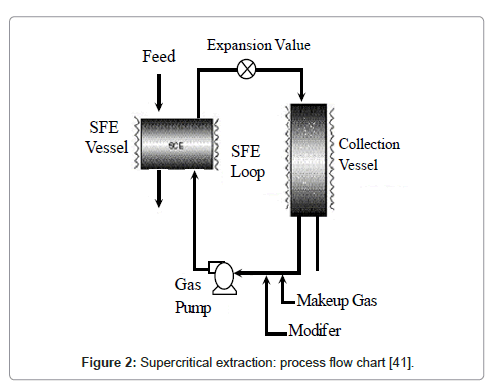 Figure 2: Supercritical extraction: process flow chart . Sesame oil, queen of oils is an ingredient of varieties of food. It is used as a substitute for olive oil, as a salad oil and for cooking fish and vegetables in many parts of the world. Aqua hulled, double washed and dried sesame seeds are used on hamburger buns. Roasted natural sesame seeds are used in the preparation of bread, breadsticks, cookies, chocolates and ice creams. Mechanically hulled sesame seeds are the basis for candies and creamy, sweet wholesome tahini. The antioxidant property of refined sesame oil contributing for its greater shelf life makes it suitable for food industry. Sesame seed sprouts, sesame broccoli rice, ginger sesame chicken, sesame granula, hummus, sesame spread, tangerine and sesame, sesame seed sauce and sesame pasteries are a few recipes of sesame . The de-oiled meal obtained from extraction of sesame oil is mainly utilized as cattle and poultry feed [6,26]. In recent times it has been important to identify the dietary components that lower or regulate cholesterol levels. Any natural substance interfering in the cholesterol metabolism preventing hypocholesterolemic atherosclerosis has gained therapeutic importance. The major lignan sesamin, present in sesame seeds is mainly related to lipid metabolism through a series of biochemical actions in both humans and animals . Dietary sesamin and episesamin has shown significant increase in the gene expression of mitochondrial and peroxisomal fatty acid oxidation enzymes such as carnitine palmitoyltransferase, acyl-CoA dehydrogenase, acyl-CoA oxidase, 3-hydroxyacyl-CoA dehydrogenase, enoyl-CoA hydratase, and 3-ketoacyl-CoA thiolase thus increasing the hepatic activity of fatty acid oxidation which is due to enhanced ketone body production. This hepatic fatty acid metabolism accounts for lowering the serum lipid level [28,29]. Sesamin also increases the activity and gene expression of malic enzyme which has lipogenic activity . Alpha-tocopherol greatly accentuates the hypo cholesterolemic action of sesamin, although which alone does not affect the concentration of serum cholesterol . A characteristic feature of Alzheimer’s disease (AD) i.e. a neurodegenerative disease is seen to be cognitive decline, memory impairment and behavioural abnormalities as a result of neural loss. This can be explained by subtle alterations of synaptic efficacy prior to the neuronal death. Neurotrophic factors such as nerve growth factor (NGF) play a vital role in neuronal differentiation, development and synaptic plasticity . When sesamin and episesamin (sterioisomer of sesamin) are ingested, sesamin is metabolised by cytochrome P40 to SC1 (2-(3,4-methylenedioxyphenyl)- 6-(3, 4-dihydroxyphenyl)-3,7-dioxabicyclo Octane) which is then metabolized to SC2. Similarly episesamin is metabolized to EC1 and then EC2. These compounds are further metabolized to SC-1m, SC-2m EC-1m and EC-2m by catechol-O-methyl transferase (COMT). The primary metabolites of this cycle exhibit the most potent neural differentiation activity . It is impressive to state that sesame oil which is rich in poly unsaturated fatty acids-PUFA, sesamin and vitamin E greatly reduces hypertension when compared to the blood pressure lowering drugs . Sesamin feeding significantly decreases the wall thickness and area of aorta and superior mesenteric artery. It also decreases histological renal damage such as the thickening of tunica intima and fibrinoid degeneration of the arterial wall, a feature not observed in normal diet . Sesamin is valuable for prophylactic treatment to fight the development of cardiac hypertrophy and renal hyper tension . The important antioxidants sesaminol, sesamolinol, sesamolin and sesamin maintain the fats including Low Density Lipoproteins (LDL) which cause arteriosclerosis and are believed to promote the integrity of body tissues. These antioxidant lignans have shown hypocholesterolemic and immunomodulatory effect . Vitamin E, a fat soluble antioxidant, protects the body from harmful oxidizing compounds. Sesame seed oil contains gamma tocopherols along with sesaminol and sesamin which possesss Vitamin E like activity. UV light produces various reactive oxygen species (ROS) in the skin causing skin damage such as sunburns, wrinkles and skin cancer . The antioxidants present in sesame act as a defence against these ROS. Chen et al. reported that the mutation caused by UV irradiation on p53 gene can be prevented by topical application of alpha-tocopherol. Dietary intake of α-tocopherol reduces photocarcinogenesis induced by UVB light . Application of sesame oil with turmeric powder in milk on the facial skin, makes it smooth, soft removing pimples . Sesame oil is known since vedic times and is the most esteemed oil in ayurveda. Sesame oil is known for its healing properties and has a reputation as a sedative in Tibetan medicine and also used for millennia in Chinese system of medicine [37-39]. In ayurveda, sesame is known to cure Tridoshas . During Abhyanga, a form of massage, the oil is rubbed externally on the skin to improve energy flow and help free the body from impurities. In ayurveda, sesame oil is regarded as an anti bacterial mouthwash and it can also be applied to nostrils to relieve anxiety and insomnia. The pain associated with premenstrual syndrome (PMS) can be overcome by applying the oil on to the abdomen region [38,39]. According to traditional system of medicines, sesame is known to cure bleeding dysentery, burns, ear pain, headache and impotency . Gram negative bacteria causing nosocomial infection is a serious concern in the developing countries. Owing to this problem sesame kernel meals have shown the presence of novel anti microbial peptides. Through HPLC and mass spectrometric analysis, a major peptide of approximately 5.8 kDa (in both white and black cultivars) has been identified to be an antimicrobial peptide having bactericidal activities against Klebsiella species, responsible for human urinary infection . Thus, it proves to be a potential method for hospital infection control and also to decrease the bacterial resistance to synthetic antibiotics . Sesamin, a non fat portion of sesame seed oil, curbs delta-5- desaturase activity and cause compilation of dihomo-gamma-linolenic acid (DGLA), which deracinates arachidonic acid, and subsequently decreases the formation of pro inflammatory mediators [14,41]. Diets containing sesame seed oil and quilA (a spawning that emulsifies fat) exert cumulative effect that decreases the levels of dienoic eicosanoids along with IL-1 beta, elevating the levels of IL-10 with marked increased capacity of endurance. Many plant based nutraceuticals are developed from sesame, the intake of which is related with dietary and non dietary phytochemicals and health . The antioxidant and health promoting property of sesame lignans (sesamin and sesamolin) increases both hepatic mitochondrial and peroxisomal fatty acid oxidation rate. Consumption of sesame seed increases plasma gamma-tocopherol and enhances vitamin-E activity which can prevent cancer and heart disease. Sesame seed contains cephalin which has hemostat activity. Fibres from sesame are used as an antidiabetic, antitumor, antiulcer, cancer preventive and cardioprotective . For pharmaceutical applications, sesame oil is used as a solvent for intramuscular injections and has nutritive, demulcent, and emollient properties and as a laxative. It was used to cure toothaches and gum diseases in 4th century. It is also used for the treatment of blurred vision, dizziness and headaches. The oil is more efficient than isotonic chloride solution in curing nasal mucosa dryness due to winter. The high polyunsaturated fat content in oil reduces cholesterol. Sesame oil has been used by Indians as an antibacterial mouthwash, to relieve anxiety and insomnia. Malignant melanoma growth was selectively inhibited due to the presence of large amount of linoleate in triglyceride form in sesame oil . Biodiesel, a fatty acid based ester obtained by transesterification of triglycerides and low boiling short chain alcohols is a substitute for fossil fuels. Diesel engines, boilers or other combustion equipments need not be modified for the use of biodiesel. It is a renewable source and does not contribute to global warming as CO2 emission can be reduced by 78% . Other advantages include excellent biodegradability, low toxicity, outstanding lubricity and superior combustion efficiency. Present studies indicate that sesame can be used for the production of biodiesel by the use of methanol in the presence of NaOH as catalyst. Biodiesel produced by this method are under the limits of required standards. Few undesirable properties of triglycerides which result in severe engine deposits, injector coking and piston ring sticking have necessitated chemical alterations thus preventing the use of sesame oil directly. India is the largest producer of sesame, which has high nutritive and therapeutic qualities. Sesame is a rich source of macro and micro nutrients including proteins, dietary lignans, vitamins, calcium, phosphorous and others but not many value added products other than sesame oil has been developed (Table 3). When analysed, it is found that the by-products obtained extraction of oil contains comparatively high nutritive value and in future, can be consumed as a supplement for protein rich food. With the advancement in technology sesame oil when blended with rice bran or Soya or other oil can be of a great advantage with respect to nutritional aspects. Nutraceuticals and pharmaceutical products of sesame can decrease the risk of neurological, dermatological, cancer and heart disease. The future of sesame lies in its by-products and biodiesel application. Table 3: Nutritional aspects of sesame . The authors are grateful to the Principal, Sri Jayachamarajendra College of Engineering, Mysore and the Head of the Department, Department of Biotechnology for providing facilities for the research work. They also thank Ms. Thiagarajan Agro Products, (P) Ltd. (Sastha oil), Madurai for their support. Saydut A, Duz MZ, Kaya C, Kafadar AB, Hamamci C (2008) Transesterified sesame (Sesamum indicum L.) seed oil as a biodiesel fuel. Bioresour Technol 99: 6656-6660. Hiremath SC, Patil CG, Patil KB, Nagasampige MH (2007) Genetic diversity of seed lipid content and fatty acid composition in some species of Sesamum L. (Pedaliaceae). Afr J Biotechnol 6: 539-543. Bisht IS, Mahajan RK, Loknathan TR, Agrawal RC (1998) Diversity in Indian sesame collection and stratification of germplasm accessions in different diversity groups. Genet Resour Crop Ev 45: 325-335. Banerjee PP, Kole PC (2009) Analysis of genetic architecture for some physiological characters in sesame (Sesamum indicum L.). Euphytica 168: 11-22. Nayar NM, Mehra KL (2002) Sesame: Its uses, botany, cytogenetics, and origin. Econ Bot 24: 20-31. Reshma MV, Balachandran C, Arumughan C, Sunderasan A, Sukumaran D, Thomas S, Saritha SS (2010) Extraction, separation and characterisation of sesame oil lignan for nutraceutical applications. Food Chem 120: 1041-1046. Elleuch M, Besbes S, Roiseux O, Blecker C, Attia H (2007) Quality characteristics of sesame seeds and by-products. Food Chem 103: 641-650. Shahidi F, Amarowicz R, Abou-Gharbia HA, Shehata AAY () Endogenous antioxidants and stability of sesame oil as affected by processing and storage. J Am Oil Chem Soc 74: 143-148. Yoshida H, Tanaka M, Tomiyama Y, Mizushina Y (2007) Antioxidant Distributions and Triacylglycerol Molecular Species of Sesame Seeds (Sesamum indicum). J Am Oil Chem Soc 84: 165-172. Tashiro T, Fukuda Y, Osawa T, Namiki M (1990) Oil and minor components of sesame (Sesamum indicum L.) strains. J Am Oil Chem Soc 67: 508-511. Johnson LA, Suleiman TM, Lusas EW (1979) Sesame protein: a review and prospectus. J Am Oil Chem Soc 56: 463-468. Laurentin H, Karlovsky P (2007) AFLP fingerprinting of sesame (Sesamum indicum L.) cultivars: identification, genetic relationship and comparison of AFLP informativeness parameters. Genet Resour Crop Ev 54: 1437-1446. Bhat KV, Babrekar PP, Lakhanpaul S (1999) Study of genetic diversity in Indian and exotic sesame (Sesamum indicum L.) germplasm using random amplified polymorphic DNA (RAPD) markers. Euphytica 110: 21-34. Abu GA, Abah D, Okpachu SA (2011) Analysis of cost and return for sesame production in Nasarawa state: Implication for sustainable development in Nigeria. Journal of Sustainable Development in Africa 13: 238-249. Bedigian D (2003) Evolution of sesame revisited: domestication, diversity and prospects. Genet Resour Crop Ev 50: 779-787. Corso MP, Fagundes-Klen MR, Silva EA, Filho LC, Santos JN, et al. (2010) Extraction of sesame seed (Sesamun indicum L.) oil using compressed propane and supercritical carbon dioxide, The Journal of Supercritical Fluids 52: 56-61. 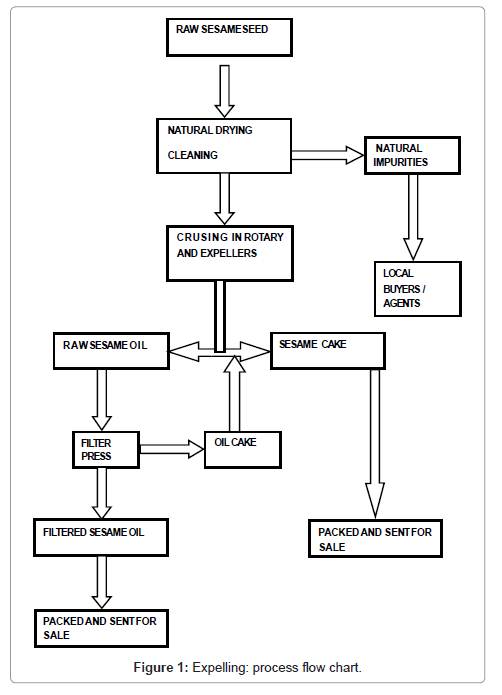 Kamal-Eldin A, Appelqvist L (1995) The effects of extraction methods on sesame oil stability. J Am Oil Chem Soc 72: 967-969. Alam MS (2007) Fats and Oils Chemistry: Factors Affecting Crude Oil Quality. Presented to the Vegetable Oils Extraction Short Course, Texas A&M Food Protein R&D Center, College Station, Texas. Doker O, Salgin U, Yildiz N, Aydogmus M, Çalimli A (2009) Extraction of sesame seed oil using supercritical CO2 and mathematical modeling. J Food Eng 97: 360-366. Morris JB (2002) Food, industrial, nutraceutical, and pharmaceutical uses of sesame genetic resources. Trends in new crops and new uses 153-156. Penalvo JL, Hopia A, Adlercreutz H (2006) Effect of sesamin on serum cholesterol and triglycerides levels in LDL receptor-deficient mice. Eur J Nutr 45: 439-444. Ashakumary L, Rouyer I, Takahashi Y, Ide T, Fukuda N, et al. (1999) Sesamin, a sesame lignan, is a potent inducer of hepatic fatty acid oxidation in the rat. Metabolism 48: 1303-1313. Ogawa H, Sasagawa S, Murakami T, Yoshizumi H (1995) Sesame lignans modulate cholesterol metabolism in the stroke-prone spontaneously hypertensive rat. Clin Exp Pharmacol Physiol Suppl 22: S310-S312. Nakabayashi A, Kitagawa Y, Suwa Y, Akimoto K, Asami S, et al. (1995) alpha-Tocopherol enhances the hypocholesterolemic action of sesamin in rats. Int J Vitam Nutr Res 65: 162-168. Hamada N, Fujita Y, Tanaka A, Naoi M, Nozawa Y, et al. (2009) Metabolites of sesamin, a major lignan in sesame seeds, induce neuronal differentiation in PC12 cells through activation of ERK1/2 signaling pathway. J Neural Transm 116: 841-852. Noon DD (2003) Sesame Oil Benefits Blood Pressure Cooking Oil Switch May Be High Blood Pressure Treatment, Inter-American Society of Hypertension. Matsumura Y, Kita S, Tanida Y, Taguchi Y, Morimoto S, et al. (1998) Antihypertensive effect of sesamin. III. Protection against development and maintenance of hypertension in stroke-prone spontaneously hypertensive rats. Biol Pharm Bull 21: 469-473. Kita S, Matsumura Y, Morimoto S, Akimoto K, Furuya M, et al. (1995) Antihypertensive effect of sesamin. II. Protection against two-kidney, one-clip renal hypertension and cardiovascular hypertrophy. Biol Pharm Bull 18: 1283-1285. Hemalatha S, Ghafoorunissa (2004) Lignans and tocopherols in Indian sesame cultivars. J Am Oil Chem Soc 81: 467-470. Yamada Y, Obayashi M, Ishikawa T, Kiso Y, Ono Y, et al. (2008) Dietary tocotrienol reduces UVB-induced skin damage and sesamin enhances tocotrienol effects in hairless mice. J Nutr Sci Vitaminol (Tokyo) 54: 117-123. Collinge W, American Holistic Health Association (1996) The American Holistic Health Association Complete guide to alternative medicine. Warner Books, New York, USA. Costa FT, Neto SM, Bloch C Jr, Franco OL (2007) Susceptibility of human pathogenic bacteria to antimicrobial peptides from sesame kernels. Curr Microbiol 55: 162-166. Chavali SR, Zhong WW, Forse RA (1998) Dietary alpha-linolenic acid increases TNF-alpha, and decreases IL-6, IL-10 in response to LPS: effects of sesamin on the delta-5 desaturation of omega6 and omega3 fatty acids in mice. Prostaglandins Leukot Essent Fatty Acids 58: 185-191. Chavali SR, Zhong WW, Utsunomiya T, Forse RA (1997) Decreased production of interleukin-1-beta, prostaglandin-E2 and thromboxane-B2, and elevated levels of interleukin-6 and -10 are associated with increased survival during endotoxic shock in mice consuming diets enriched with sesame seed oil supplemented with Quil-A saponin. Int Arch Allergy Immunol 114: 153-160. Balan V, Rogers CA, Chundawat SPS, da Costa Sousa L, Slininger PJ, et al. (2009) Conversion of Extracted Oil Cake Fibers into Bioethanol Including DDGS, Canola, Sunflower, Sesame, Soy, and Peanut for Integrated Biodiesel Processing. J Am Oil Chem Soc 86: 157-165. Moazzami AA, Kamal-Eldin A (2006) Sesame seed is a rich source of dietary lignans. J Am Oil Chem Soc 83: 719-723. El Tinay AH, Khattab AH, Khidir MO (1976) Protein and oil compositions of sesame seed. J Am Oil Chem Soc 53: 648-653. Supercritical Fluids (SCF) and supercritical Fluid Extraction (SFE) prepared at thermodynamics research laboratory, Department of Chemical Engineering. Copyright: © 2012 Nagendra Prasad MN, et al. This is an open-access article distributed under the terms of the Creative Commons Attribution License, which permits unrestricted use, distribution, and reproduction in any medium, provided the original author and source are credited.